Ask fellow campers about "Doolittle County Park" and nearby attractions. This is a small, county park. Some of the sites are seasonal. The sites are tiny and you are only a few feet away from your neighbor, on both sides. Most of the sites are on the lake, which is beautiful. Our site was so small, that we could not use the fire ring, which was literally in the lake weeds. There is a swimming beach and play area. The bathrooms were clean and modern; there are pay showers (bring quarters). 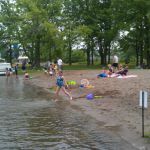 This campground is not a destination in and of itself, but makes a nice base camp for area activities or overnighting. We camped at Doolittle County Park in a Travel Trailer. Are you affiliated with Doolittle County Park ?